Skating at Curry Village Ice Rink in Yosemite National Park. Photo by Dolan Halbrook. How cold has it been? 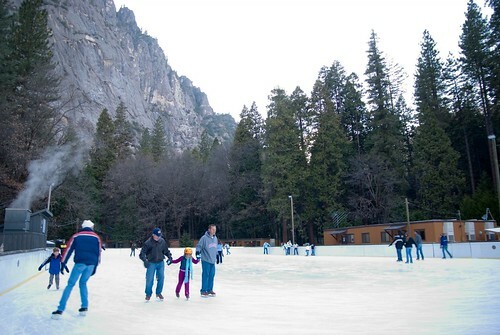 Well cold enough that the Yosemite Ice Rink at Curry Village is scheduled to open this Friday, November 20th. If you’ve never visited the rink it’s located just outside Curry Village and affords you an awesome view of Half Dome. It’s a great place to hang out and have fun especially if you come up with people who want to go skiing at Badger Pass (not open yet) and you want something to do. It’s $8 for adults, $6 children and skate rentals are $3. There’s an outdoor fire ring to get warm by and supplies for making smores and hot drink are available in the store. For more information call (209) 372-8319 or visit YosemitePark.com. Its great to see the rink open for the season. I would definitely recommend taking in a session if you will be visiting the valley in the next few months. The views of Half Dome are worth the price of addmission. The weekend sessions can be packed especially in the evenings, but there is usually plenty of room to skate. The slowest sessions are usually the first morning session and the first evening session. I loved my time working at the ice rink and belive it to be one of the best jobs in the world. There is nothing like ice skating in Yosemite! I love to head into the park and skate under a full moon. When I get too cold, I grab a cocoa and sit by the fire. The entire experience is wonderful.